Ever wonder about the trails we hike on? Their history, who made them, who maintains them. I know that some of us personally volunteer to maintain trails. The US Forest Service works hard on some and also manages some of the volunteers. 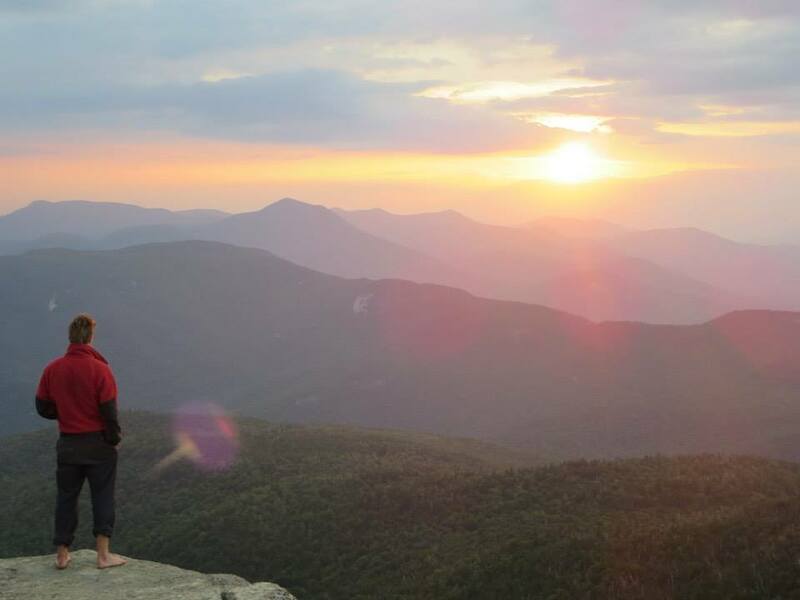 Also, there are volunteer organizations like the Trailwrights, and last but not least, the Appalachian Mountain Club (AMC). The AMC maintains hundreds of miles of trails — over 300 of the 1440 miles total in the White Mountain National Forest either through the numerous volunteers it manages or by doing the work themselves with the help of their trained trail professionals. This story, written by long time AMC Trail Crew member Sam Kilburn, is about them. Thank you, Sam. The 2016 A.M.C. White Mountain Professional Trail Crew. The author, upper right, raising his axe. Creedence Clearwater Revival blares from the stereo in the corner and 18 members of the A.M.C. Trail Crew swing out of bed. Wiping the exhaustion from my eyes, I throw on my work clothes for the day: faded blue Dickies, Limmer Boots, and a wool shirt. I head over to the Trading Post at the Pinkham Notch Visitor Center for breakfast. After a brief breakfast of yogurt, granola and fruit, the work day begins. I gather every item I will need for the day in my small backpack. My lunch, first aid kit, rain jacket, radio, map, headlamp, and sharpening stone are stored inside, while my double-bit axe, helmet and water bottles are stowed on the outside of my pack. I head downstairs into our workshop and grab a hazel hoe — the final item needed for the day ahead. The entire crew circles up for a brief safety meeting, and then we all file into three separate trucks and drive to our respective trailheads. There are three different crews out; each crew has their own route, their own summits to climb, and their own trails to clear. A crewmember looks out at the sunset from the summit of Mt. 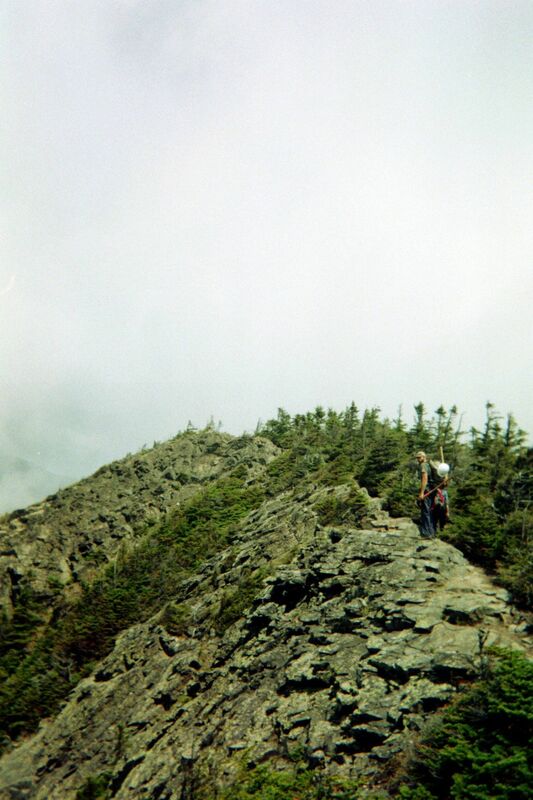 Chocorua. Welcome to patrolling season on the A.M.C. White Mountain Professional Trail Crew. During late May and early June we spend our days clearing blowdowns and cleaning drains on all of the trails maintained by the Appalachian Mountain Club. Patrolling season is often the most physically-intensive portion of the summer. 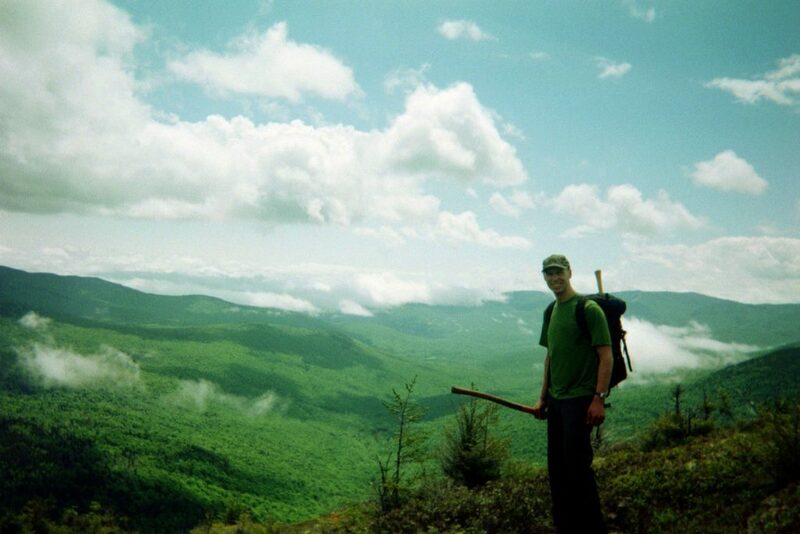 Patrolling days sometimes last 13 or 14 hours and cover many miles, trails, and summits of the White Mountains. The only break during the day is for lunch, and it is a brief respite at that. Instead our days are spent hustling along trails, clearing and cleaning them for the masses of hikers that will come with the summer season. Once our day is complete, we drive back to Pinkham Notch for dinner. After eating, showering, and preparing a lunch for the following day, some of the crew gathers in the living room to share stories of the day, grease boots, and sharpen axes. Before too long the entire crew is in bed and asleep, resting sore muscles and weary bones. After all, tomorrow brings more summits to be climbed and more fallen trees to be chopped. 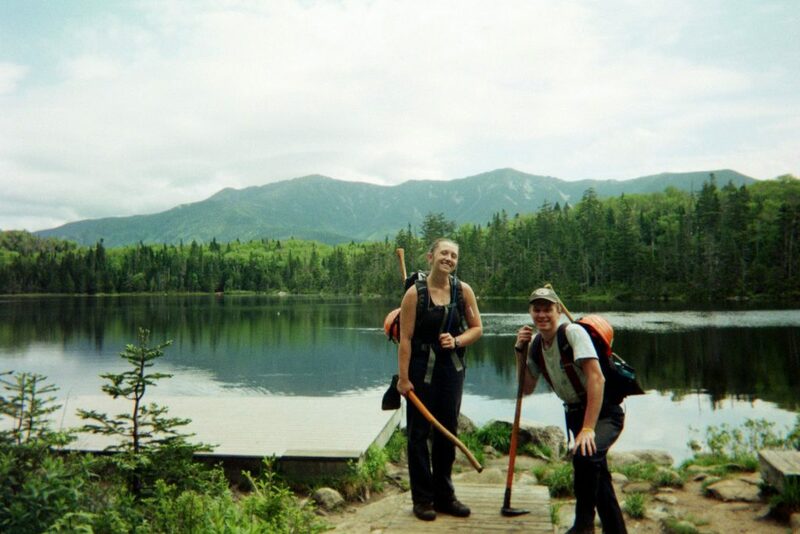 Two crewmembers pose for a photo at Lonesome Lake. A crewmember looks on during a patrol in Franconia Notch. A crewmember stops during a patrol for a photo, location unknown. 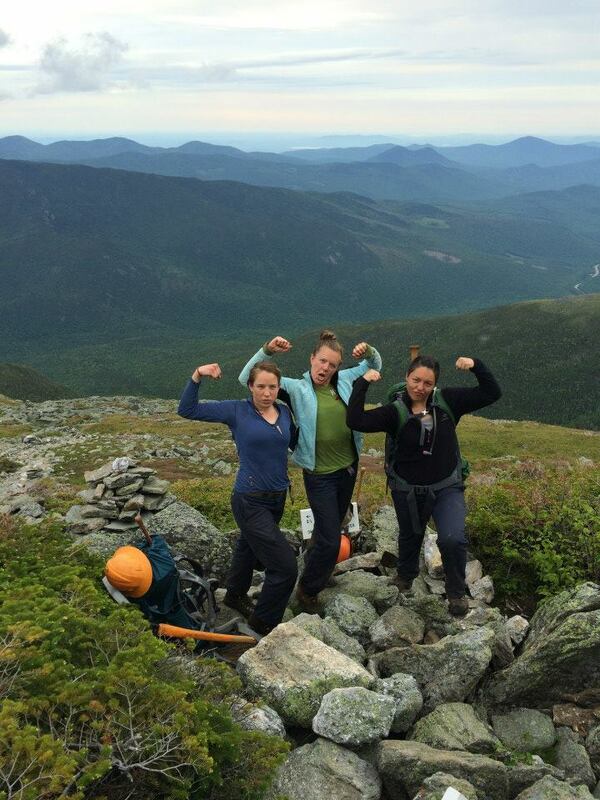 Three crewmembers pose during a patrol on Boott Spur Trail. By the middle of June, patrols finish up and the A.M.C. Professional Trail Crew transforms from fast and quick patrollers into slow, steady, and bulky rock workers. Modern cloth backpacks capable of carrying only a day’s load are replaced with archaic wooden packboards, capable of carrying over two-hundred pounds. Hazel hoes are replaced by rock bars, pick mattocks, griphoists, and rock drills – but the axes, a companion to anyone on the A.M.C. 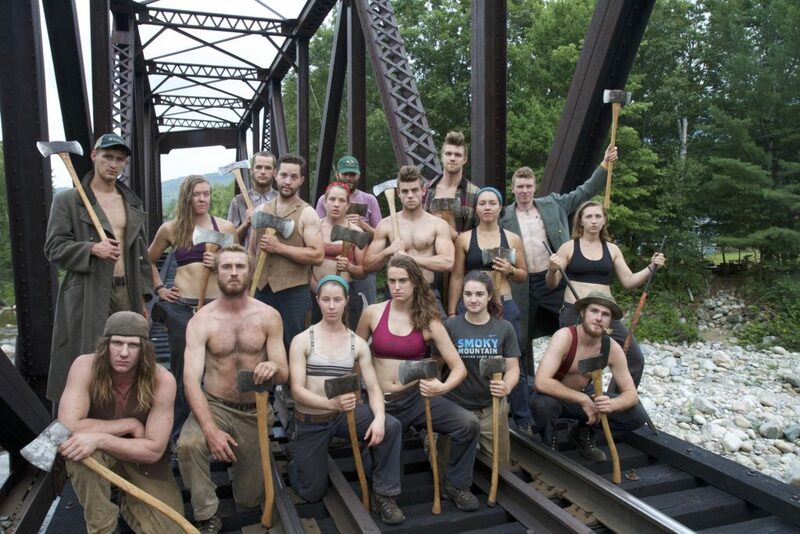 Trail Crew, remain undisputed. The rock work season lasts until the end of the summer, and is the most defining time of the summer. During the rock work season, each crew camps out for the entire week. The extended time spent together in the woods allows for lifelong bonds to cement between the members A.M.C. Trail Crew. Days bring hours of grueling and demanding work, while evenings bring enormous pots of food, and a chance to relax and unwind with the rest of the crew. Projects last between one week and the entire remainder of the summer. The A.M.C. 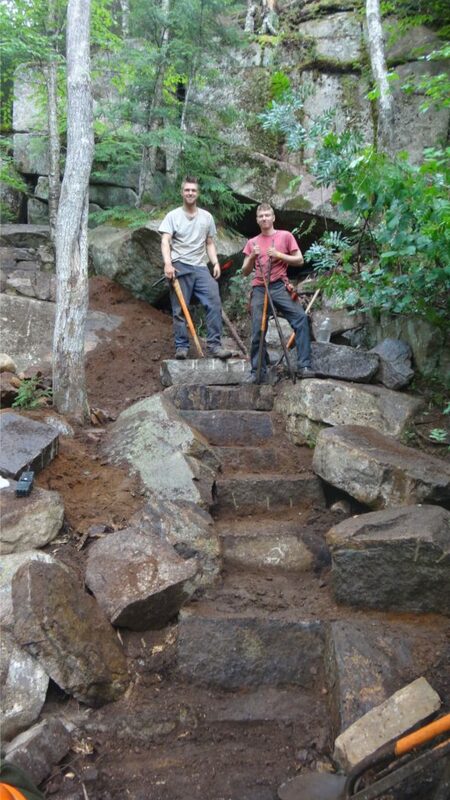 Trail Crew currently specializes in rock work projects, building stone staircases and water bars throughout the trails of the White Mountains. Other projects include trail relocations, construction of wooden bridges, wooden water bars, and more. Weeks in the woods fly by, and soon August arrives and the end of the summer comes into view. By the end of August, the A.M.C. White Mountain Professional Trail Crew disperses. Some stay for a fall season working for the A.M.C. Trails Department, some return to school, and others hit the road to get to the next seasonal job. As soon as spring arrives, once again the A.M.C. Trail Crew will return to the White Mountain trails and get to work. 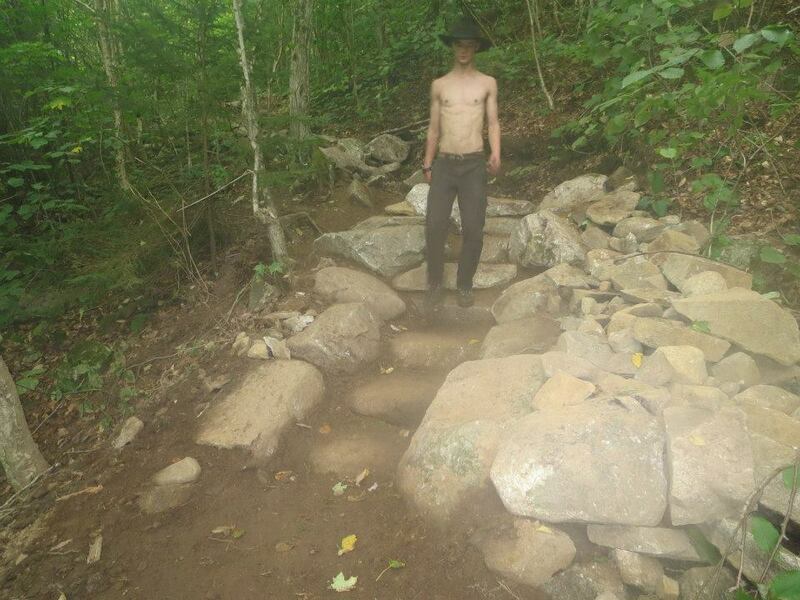 A crewmember walks over his newly constructed staircase on Champney Falls Trail. Two crewmembers stand atop a staircase still under construction. Champney Falls Trail. Some of my friends and family members don’t understand why I keep returning to work for the A.M.C. Trail Crew year after year. After all, I could make more money waiting tables, and just about any other job would be easier on my body. But for me, my time on the AMC Trail Crew is priceless. There is something about life on this trail crew that has become increasingly hard to come by in today’s world. Life is raw; it’s stripped down to the bone. It’s simple, secluded, demanding, exhausting, and exciting. I found a home on the A.M.C. Professional Trail Crew. Like so many others that came before me, this job has changed my life. It changed my work ethic, it changed what I value in myself and others, it changed how I act, and it changed what I want to do with my life. The A.M.C. White Mountain Professional Trail Crew has been shaping and changing the lives of young men and women since 1919, and will continue to do so for many decades to come. For those wanting to know more, Sam will be presenting at the Pinkham Notch Visitor Center about life on the A.M.C. Trail Crew and his alpine trails research project on January 7th at 8pm. Be sure to check him out. He’s good people.